Both the 2019 GMC Terrain and the 2019 Jeep Compass are excellent choices among a broad field of compact SUVs. While they are both similar in overall size, they have their own distinct personalities. Here’s a rundown to help you select which of these two great SUVs best fit your lifestyle, available at Essig Motors. 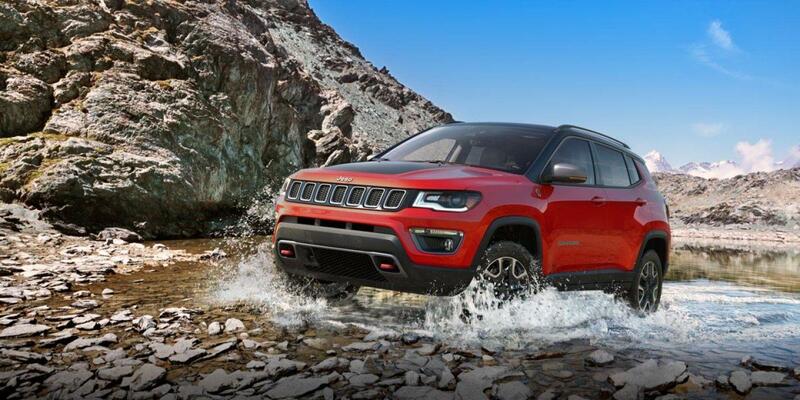 The Jeep Compass normally-aspirated 2.4L DOHC four-cylinder engine produces 10 more horsepower (180 vs. 170) than the Terrain’s standard 1.5L turbocharged four-cylinder engine. However, the Terrain’s standard engine produces 28 lbs.-ft. more torque (203 vs. 175) than the Compass 2.4L four-cylinder. The GMC Terrain offers an optional 2.0L turbocharged four-cylinder engine that produces 72 more horsepower (252 vs. 180) and 85 lbs.-ft. more torque (260 vs. 175) than the only available engine in the Jeep Compass. Both the 2019 Jeep Compass and the 2019 GMC Terrain both offer automatic transmissions. However, only the Compass also offers a manual transmission, which can be an advantage to drivers who want to take their vehicles off-road. Front-wheel drive is standard on the GMC Terrain, and all-wheel drive is available with a knob to engage the part-time system. Being a Jeep means you have true AWD capabilities, it offers the available Jeep Active Drive, Selec-Terrain Traction Management System with settings for Auto, Snow, Sand, Mud or Rock, as well as a 4WD Low setting for slow crawling on rocks or in mud. The Compass has standard front and rear stabilizer bars, which help keep the Compass flat and controlled during cornering. The Terrain’s suspension doesn’t offer a rear stabilizer bar. For a smoother ride and more stable handling, the Terrain’s wheelbase is 3.5 inches longer than on the Compass (107.3 inches vs. 103.8 inches) while the track (width between the wheels) on the Terrain is 1.6 inches wider in the front and 2.2 inches wider in the rear than on the Compass. However, being slightly shorter and narrower has its advantages as well. For example, the Jeep Compass turning circle is 2.1 feet tighter than the Terrain on the standard tires, and it’s even greater on models with 19” tires. Further, a narrower vehicle is easier to park in tight spaces or driving between trees or rocks off-road. And for greater off-road capability the Compass has a 1.3 inches greater minimum ground clearance than the Terrain SLE (8.2 vs. 6.9 inches), allowing the Compass to travel over rougher terrain without being stopped or damaged. The Terrain’s standard towing capacity is much higher than the Compass’ (1500 vs. 0 pounds). Maximum trailer towing in the Jeep Compass 4x4 is only 2000 lbs. The Terrain offers up to a 3500 lbs. towing capacity. The Terrain’s corrosion warranty is 1 year longer than the Compass’ (6 years vs. 5 years). 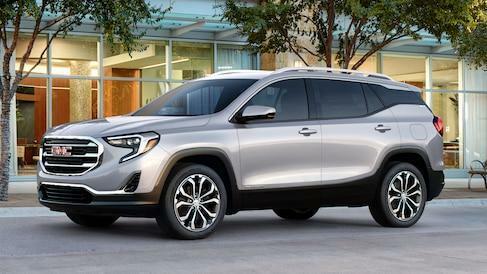 In addition, GMC pays for scheduled maintenance on the Terrain for two years or 24,000 miles. GMC will pay for oil changes, lubrication and any other required maintenance (up to two oil changes). Jeep doesn’t pay scheduled maintenance for the Compass. The Compass’ corrosion warranty is longer than the Terrain’s (unlimited vs. 100,000 miles). For enhanced safety, the front seat shoulder belts of the Jeep Compass are height-adjustable to accommodate a wide variety of driver and passenger heights. A better fit can prevent injuries and the increased comfort also encourages passengers to buckle up. The GMC Terrain doesn’t offer height-adjustable front seat belts, while the GMC Terrain’s rear seat shoulder belts have child comfort guides to move the belt to properly fit children. The Compass has standard Active Head Restraints, which use a specially designed headrest to protect the driver and front passenger from whiplash. During a rear-end collision, the Active Head Restraints system moves the headrests forward to prevent neck and spine injuries. The Terrain doesn’t offer a whiplash protection system. When turning the vehicle off, drivers of the Terrain are reminded to check the back seat if they opened the rear door before heading out. The Compass doesn’t offer a back seat reminder. The Terrain Denali offers an optional Surround Vision to allow the driver to see objects all around the vehicle on a screen. The Compass only offers a rear monitor and rear parking sensors that beep or flash a light. That doesn’t help with obstacles to the front or sides. Both the Terrain and the Compass have standard driver and passenger frontal airbags, front side-impact airbags, side-impact head airbags, front seatbelt pretensioners, front-wheel drive, plastic fuel tanks, four-wheel antilock brakes, traction control, electronic stability systems to prevent skidding, daytime running lights, rearview cameras, available all-wheel drive, crash mitigating brakes, lane departure warning systems, blind spot warning systems and rear cross-path warning. So, to compare two of the best small SUVs around, check out Essig Motors new vehicle inventory which includes both the 2019 GMC Terrain and the 2019 Jeep Compass, so you can compare for yourself.